As discussed in the last blog post on farmers in the Western Region, agriculture is an important sector of Irish economy and particularly important to the rural economy and society. In this post different measures of payments and income are examined using three different sources. Data on CAP beneficiaries is available at county level, showing how much is received in each county, while the recently published Revenue data for 2016 provides information on average Farming Income and Gross Income for the ‘farming cases’. Finally, the National Farm Survey, conducted by Teagasc, provides detailed information on farming income. Each of these sources is measuring different things for different purposes so it is useful to compare them to add to our understanding of farming in the Western Region. The Common Agricultural Policy (CAP) contributes a significant amount to the local economy. 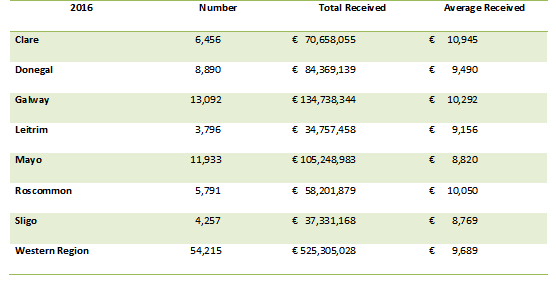 In 2016 more than €525m was received from the CAP by the 54,215 beneficiaries in the Western Region (Table 1) with an average of €9,689 per recipient in the Western Region. Galway (€ 135m) and Mayo (€105m) had the highest receipts and also had the highest numbers of recipients, while Leitrim (€35m) and Sligo (€37m) had the lowest total receipts. However, when the average receipt is considered (Figure 1) the pattern is different. 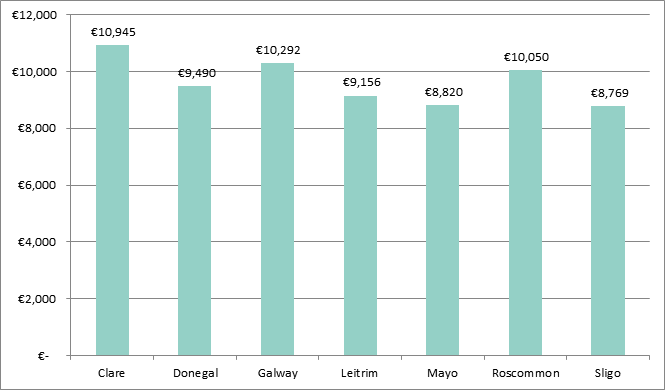 Average receipts in 2016 were highest in Clare (€10,945), Galway (€10,292), and Roscommon (€10,050), but these were still among the lowest in the country (Clare has the 17th highest average receipt, and average receipts in Galway and Roscommon were 20th and 21st of the 26 counties). 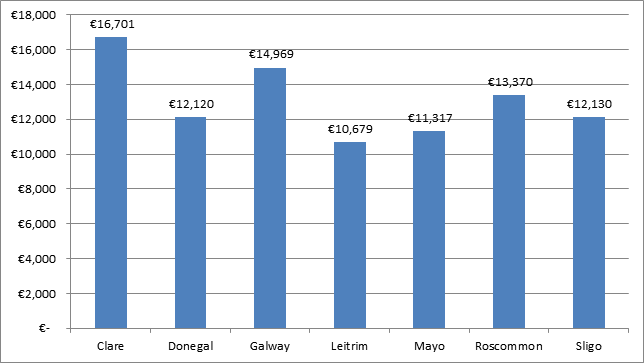 The four lowest average payments in the country were in the Western Region with Sligo the lowest in the country. In contrast, the highest average receipts were in Dublin (€19,062 and which has a very small number of beneficiaries (867)) and in the South East with €17,806 the average in Waterford, €17,205 the average in Kilkenny and €16,194 the average in Carlow. The very significant different in receipts between the Western Region and the South East reflect both farm size, and the enterprise type. In addition to information about numbers of farming cases, data is available from Revenue for both average Gross income and average Farming Income. The data for Revenue cases from farming is from the Revenue Statistics and Economic Research Branch publication ‘The Farming Sector in Ireland: A Profile of Revenue Data’ available here. In 2016 nationally there were 137,109 ‘farmer’ cases with an average Farming Income of €21,952. 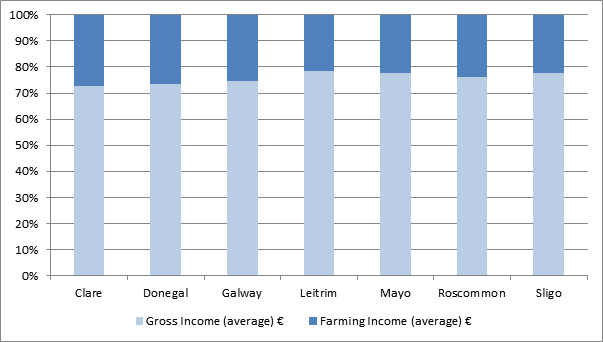 There were 40,709 ‘farmer’ cases in the Western Region with an average Farming Income of €13,338. Data for each of the Western Region counties is shown in Figure 2 below. Interestingly, for farmer cases the Revenue also provides information about the average Gross income. This includes income from other sources (the two most significant of these are PAYE income from employment and income from other business sources). It therefore includes income from off farm work. It should be remembered that where couples are jointly assessed this includes the earnings of both. Non farm income is very significant in the Western Region, accounting for most of the income in the farming cases in the Western Region indicating the importance of off farm employment in farming households. The final source of data on farm income is the National Farm Survey (NFS) which has been conducted by Teagasc on an annual basis since 1972. The survey is operated as part of the Farm Accountancy Data Network of the EU and fulfils Ireland’s statutory obligation to provide data on farm output, costs and income to the European Commission. A random, nationally representative sample is selected annually in conjunction with the Central Statistics Office (CSO). In 2016 the sample of 861 farms which represented 84,736 farms nationally. Pig and Poultry farms are not included in the survey. Data from the NFS is not available at county level, but Figure 4 below shows the Family Farm Income for 2016 for each of the NUTS 3 regions. The Border and the West regions, which account for six of the seven Western Region counties have the lowest Family Farm Income in 2016. Clare is part of the Mid West region. As Family Farm Income from the National Farm Survey is not available at county level, it is useful to compare the data on CAP beneficiaries and from Revenue tax cases at regional level. Figure 5 shows the three different payment and income measures for the NUTS 3 regions. In most regions, except the Border (and it should be noted the NFS does not include pigs and poultry which are concentrated in the Region) the Family Farm Income is the highest figure, while the average Farm Income for Revenue is lower. As expected, given that it is only one of the elements of farm income, CAP receipts are lower than either income figure. 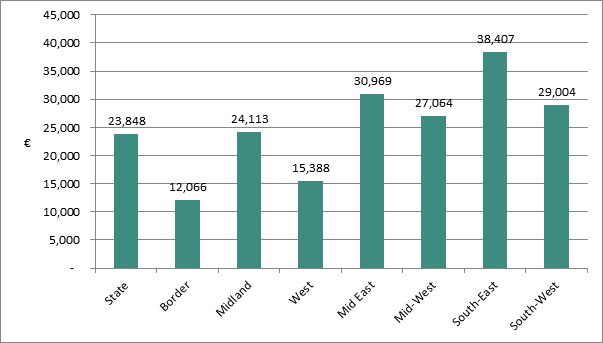 In the Border, Midland and the West Region in particular, the CAP receipts are a higher proportion of income figures, indicating the greater contribution of the subsidies to income in these regions. While these three different measures are derived from different sources they are all consistent. 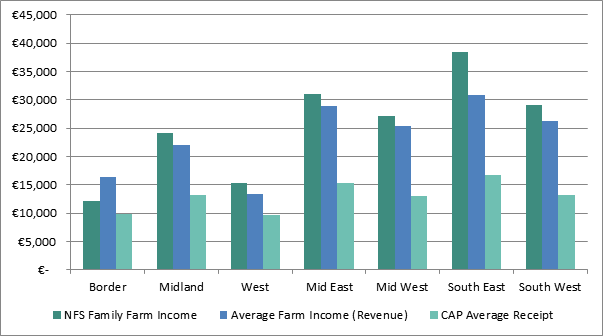 The West and Border have lowest income and lowest average CAP benefit as well as lower taxable income from farming. The pattern of farming is different in these regions, with different enterprise types, smaller farm sizes and greater reliance on off farm income. Yet farming in these regions is integral to their rural economy, the rural landscape and CAP payments and their multipliers make a significant contribution the local economy. These are all important considerations when negotiating the next CAP. Family Farm Income represents the return from farming for the farm family to their labour, land and capital. It does not include non-farm income. See here for more information.